Dr. Ray T. Matheny, Professor Emeritus of Anthropology at BYU, where he mentored undergraduate and graduate students, also established the first BYU field school of archaeology and was the initiator and director of numerous archaeological projects. 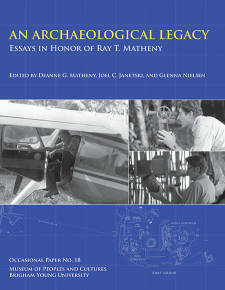 An Archaeological Legacy contains a short biography of Dr. Matheny’s life and work as well as essays by his colleagues—many of whom are his former students—about a variety of geographical areas and topics, mostly within the scope of the major areas of Dr. Matheny’s work: the Colorado Plateau, American Southwest, and Mesoamerica. Essays cover such topics as ancient Puebloan roads in San Juan County, Utah; Fremont farming and residential mobility on the Colorado Plateau; the Preclassic occupation of Southwestern Campeche, Mexico; early Indian schools and federal paternalism in the Four Corners Region; the protection of archaeological sites on national forests in Arizona and New Mexico; and the Paleoindian occupation at Kib-Ridge Yampa, Colorado.